Tomorrow evening we were invited to a dinner event for a professional organization I'm affiliated with. Chuck's Mom has thankfully agreed to babysit so we can attend- it will be our first date night in months. Again, #adulting. 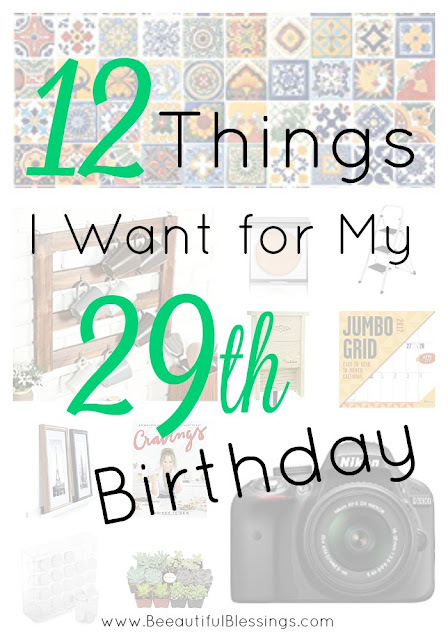 Since this year is slightly unexciting on the birthday front, I'm daydreaming about all the things I can't afford or can't realistically pull off with two children in tow. 1. Bat Shelter. I genuinely love our house, but there is one thing that I don't love. Our backyard is teeming with insects. We have crickets that get into our basement, ants building ant hills all over our driveway, bumblebees buzzing around our back patio, and mosquitoes that prevent us from enjoying summer nights around our fire pit. I really want to get a bat shelter to keep our insect population in check! 2. Cravings: Recipes for All the Food You Want to Eat . This was one of my 10 best reads in 2016. I originally borrowed this cookbook from my library, but I made so many recipes and grew to love it so much that I now want a copy for myself! 3. Acrylic 20-Bottle Spice Rack . Now that I'm cooking all the time, I'm totally preoccupied with how to reorganize and decorate my kitchen. The first step is organizing my 10,000 spice bottles! 4. Nikon D3300. If you read my confession about wanting to be a full-time blogger, you know I've been lusting after a DSLR camera for ages. This is the one I've had my eye on and with any lucky (and additional income), I'm hoping to get it by year's end. 5. ALL THE SUCCULENTS. I'm really trying to turn our home into a living, breathing little plant-filled oasis. I want to deck out our currently sad and barren master bedroom with shelves and hanging baskets filled with this beauties. 6. Wood Mug Rack. Our little dining room coffee station is constantly cluttered and I've been eyeing this mug rack to add some much needed dimension to our bare walls, and clear out some cabinet space in our kitchen! 7. Folding Step Ladder. I'm not sure how we've managed to even be homeowners this long without a step ladder, but we need it ASAP so I can paint all the things! 8. HONEST BEAUTY Luminizing Powder. I first got this at a steep discount when Honest released their beauty line. I seriously love this stuff so much on those days when I want to trade in my sleepless, Mombie skin tone for something with a little more color. 9. Floating Wall Shelf Ledge. I've been eyeing something like this to display my collection of photo albums and the boys' baby books in our living room. 10. Hand Painted Mexican Tiles. And speaking of my living room, I'm itching to replace our ugly reddish fireplace tiles with some hand painted Mexican tiles to add some color and character to the room. 11. Jumbo Grid 2017 Calendar. Chuck got me one of these for Christmas two years ago and I loved it. I thought I could get away with just a cheapo, standard all calendar, but I miss my jumbo-sized calendar taking up all my dining room wall space! 12. SLEEP. Please dear children, let me sleep.